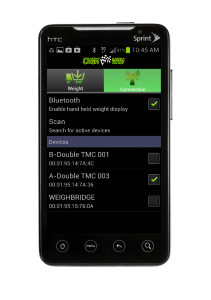 Phone-Way© is a hand held mobile application for remote viewing of on-board truck scales, truck mounted cranes and weigh-bridges With Phone-Way you can extend the capabilities and features of the Chek-Way® on-board electronic scales, whilst retaining the functionality and features of a smart phone. Chek-Way systems convenience, practicality, productivity and profitability will only increase using Phone-Way’s features, letting you focus on what’s important; total control of the job at hand. 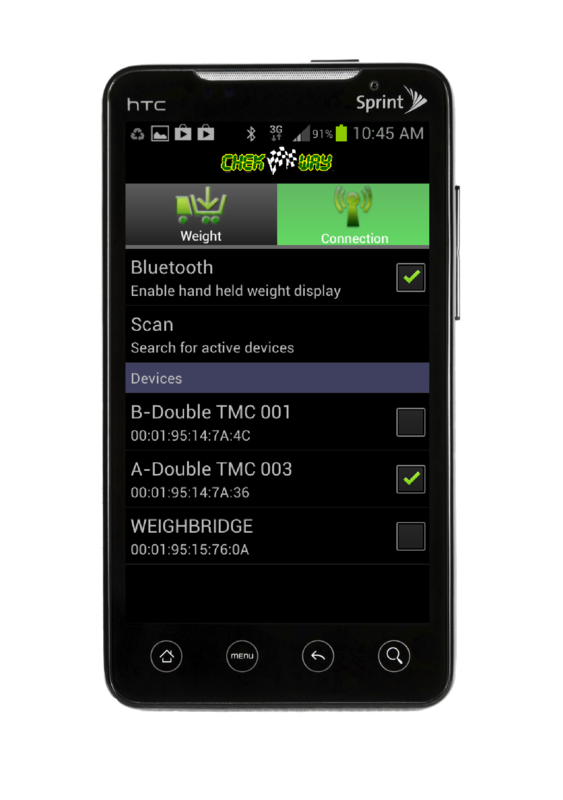 The fastest and easiest way to manage vehicle loads in the palm of your hand. 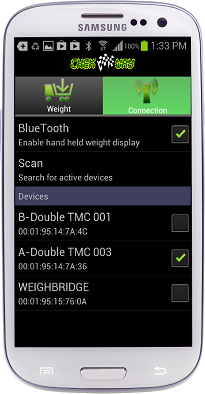 View your axle group weights from inside and outside of the vehicle with an AndroidTM phone or tablet. 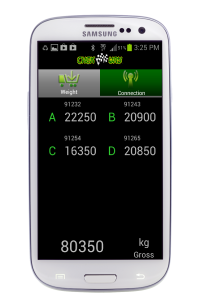 Weights appear in real time. 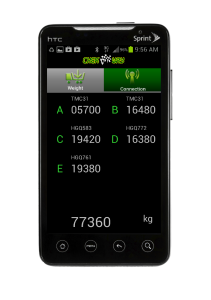 Acquiring vehicle weights for chain of responsibility and payload management purposes prior to leaving the loading and unloading site has never been easier. Incorrectly loaded axle groups are displayed in red to alert the operator to any incorrect axle weights; giving you total control of the job at hand. 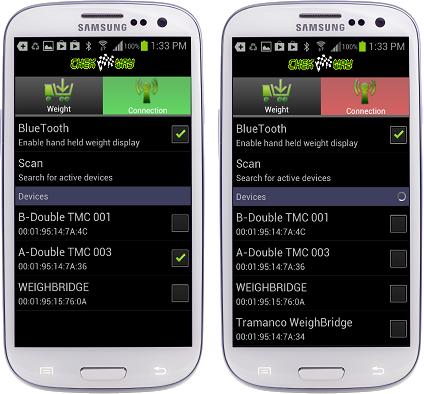 With Phone-Way’s user friendly interface, all functionality and system information is displayed directly through the use of tabs and colours. Simply enable the app for Bluetooth®and connect to the vehicle of choice. 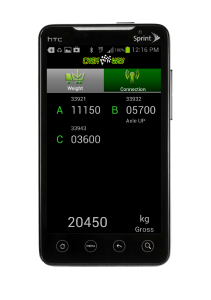 * The phone can be locked to only run the Phone-Way application, thus preventing the usage of the smart phone. 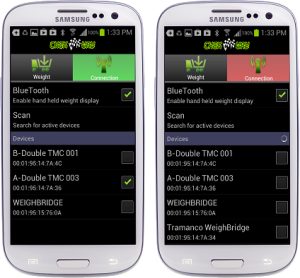 Phone-Way integrates with all Chek-Way on-board scales, weigh bridges and truck mounted crane scales, thus providing further to your requirements. 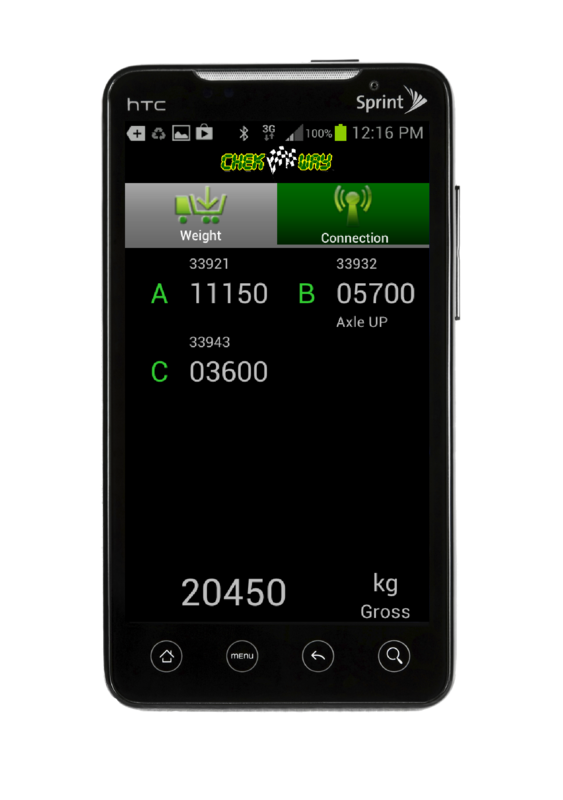 With Phone-Way you can switch between vehicles by selecting the vehicle registration or fleet number and Phone-Way does the rest. 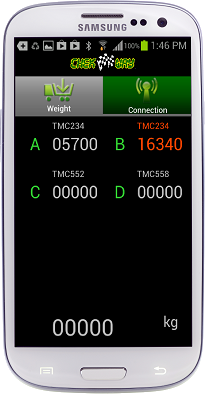 Phone-Way remembers the last vehicle selected; if the operator moves out of range, Phone-Way goes into scan mode and automatically re-connects to the same vehicle when in range again. 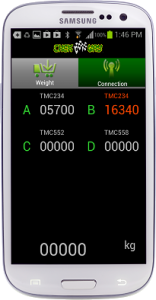 The applications connection status to a Chek-Way system is indicated by the displayed colour of the connection tab, green for a connection and red for no connection. This is another way Phone-Way helps to reduce errors. A four axle group vehicle configuration used in the below example includes prime mover (channel A) and trailer and dolly groups (channel B, C, and D). 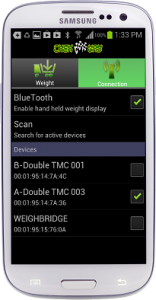 Weights display tab. 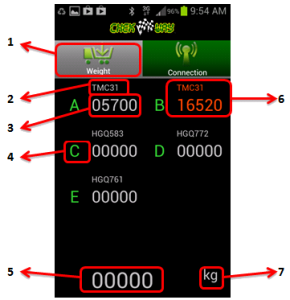 Touch this tab to display vehicle’s weight data. Chek-Way Smart Amp (CWE-5200) identification number. Red data indicates a weight overload on the axle group for the system working as on-board heavy vehicle scales. 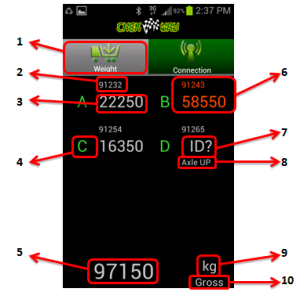 Red data displayed as part of a weigh bridge system indicates the current axle group of interest. Error in Smart Amp data. Please refer to section 4. Troubleshooting for possible reason and solutions to this error. Lift axle position. Only displays if a lift axle in that group is lifted. Units of weight measurement. 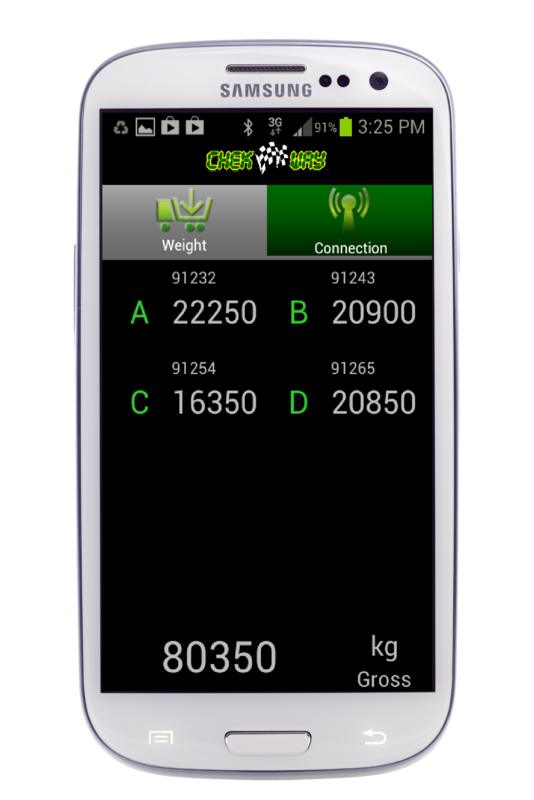 Vehicle’s weight type, either Gross or Net. A typical weigh bridge display of a five axle group vehicle proceeding over a weigh bridge. The vehicle configuration used in the below example includes steer (channel A), drive (channel B) and trailer/dolly groups (channel C, D, E). Identification number or registration number of the vehicle/trailer/dolly. Group A and B represent steer and drive of the first unit respectively. Vehicle’s total weight. This is only available upon completion of all group weights. Red data indicates the current axle group being weighed. CHEK-WAY, Phone-WAY and KWIK-CHEK registered trademarks are the property of Tramanco Pty. Ltd. Android and the Android logo are trademarks of Google inc. All other marks and trademarks are properties of their respective owners.